That contest I mentioned earlier has started over at Dear Author. I got a nice note from a reader reminding me about it this morning (thank you Darby)! 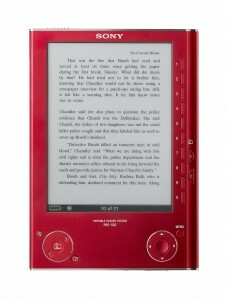 The contest ends on the 11th and requires some research over at the Sony site to answer 16 questions about the eReader. I've entered and I'd dearly love to win – I've learned quite a bit about the eReader just from this contest and the more I learn, the more I like it. The newest generation looks particularly nice, its backlit and has a touch sensitive screen.. *drools*. Now just add wireless capability and I'm thinking best thing since sliced bread. Take me now sweet eReader, my husband doesn't need to know. Head over to Dear Author to enter. This entry was posted in Uncategorized and tagged contests, ereader, giveaways by janicu. Bookmark the permalink.